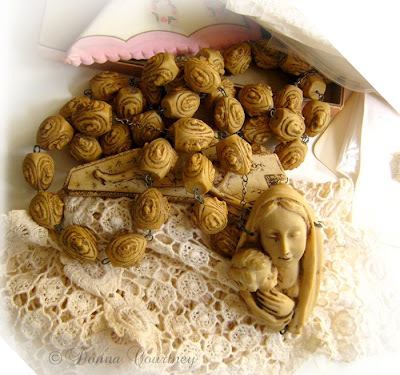 We found this lovely vintage rosary on one of our little trips close to home. I had been looking at over-sized rosaries for years but this is the first one I bought. Maybe it was the fascination I had as a child of the large rosaries the nuns wore. It looks beautiful just sitting on a table. Love the rosary!! Have a wonderful Easter! What a beautiful beautiful rosary! I took the day off from visiting yesterday, Donna, so I missed this post. Happy Easter! I hope you all had a wonderful Easter holiday.